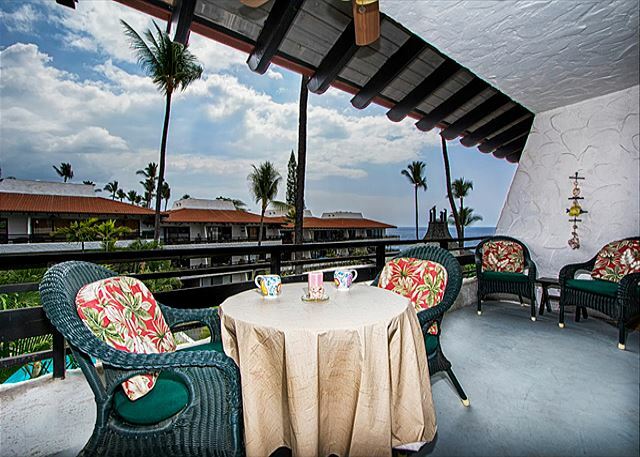 Casa 330 has a large lanai & beautiful ocean view!! See Virtual Tour link for closer look! Amazing Direct Ocean View from this top floor property! ***COMPLETE REMODEL COMPLETED JANUARY 2016 IN CONDO! Owners have extensively updated the condo from top to bottom. Flooring, Bathroom, Kitchen, Furniture, Lanai all updated! Be one of the first guests to enjoy this renovation! Casa #330 is a great little condo!! My grandparents were the original owners of this great little condo and I must say, the new owners did a great job on the reno!! Love the king bed and all the updates. Best shower ever!! A/C took awhile to catch up during the day but was fine once the sun went down. We will definitely be back!! We enjoyed our stay in this clean, updated condo. Terrific location. There were plenty of plates, flatware, and glasses; however, we could have used better cookware and cooking utensils. That is minor, and did not in any way make our stay less enjoyable. Wonderful!! Mahalo for your insight! We will communicate this with property owners and keep it in mind for plans to improve the unit! We are happy you enjoyed your stay and the location, and hope to accommodate you for a stay again in the future! Thank you for providing us with a great Location. and modernized unit. It provided us with all that we required for a Holiday in the sun..
Whilst we a little late getting into the Unit. 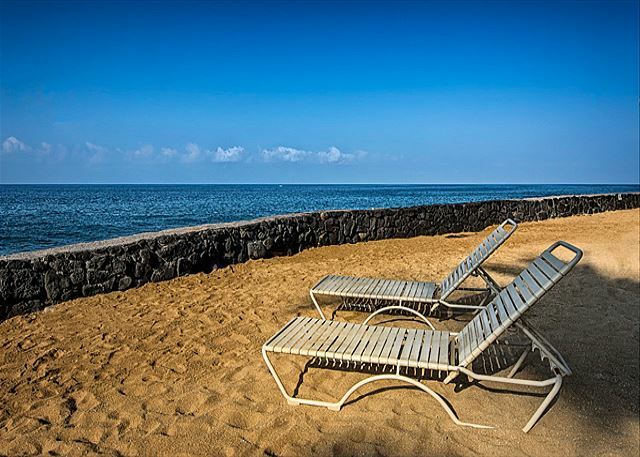 To have access to two pools, 3 new Weber BBQ,s, sunsets on the beach etc.. The other guests there were very friendly as well.. Fish Hopper, Huggos on the Rocks and so many more Restaurants were top class. Laurie & Lynne Hill and Anne Winter from Adelaide Sth Aust. Everything was seamless and great. Knutson and associates was easy to book with. 330 was quiet, clean, easy to find and convenient to attractions as well as a great ocean view. excellent flat, big, clean, nice view, quiet, nearby town. We would come again. We were very last minute. All was perfect, really good communications with Knuston and associates. Really clean, perfectly renovated place. I recommand this place. Had a good time. Weather was very cooperative. Never saw the property mgmt professional. We stayed for 8 nights in March 2016 and really enjoyed our stay. The condo was very nicely renovated, clean, and quiet. 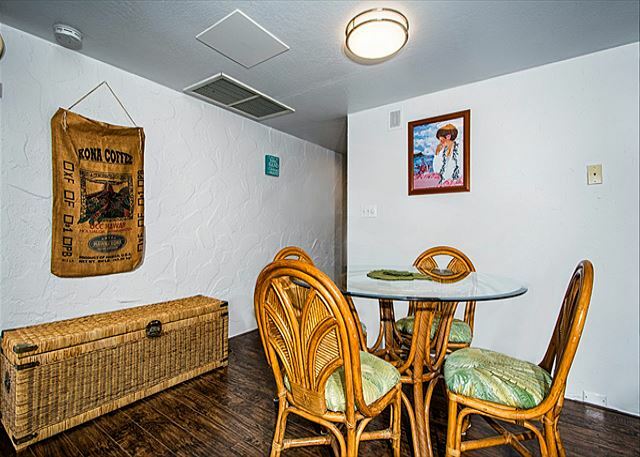 This condo has a comfy bed, large bathroom, excellent central A/C, and a kitchen fan which was very helpful when cooking. There was also beach chairs, XL towels, and coolers which was great. My only recommendation would be for more seating in the living room.We would recommend this unit to friends! I am a frequent visitor to the big island to visit family. This time we needed our own accommodations and stumbled across this gem. Our 8 day stay at this condo unit was better than we expected. The price definitely was the biggest plus, location was perfect and being on the ocean and seeing and hearing the crashing waves was amazing. The unit was redone this year as stated in the details they provide. The pics are exactly what you see, clean and comfortable. It's totally suited our needs. Knutson and Asscs provided us with a mobile ap for total convenience to check in and out, etc. They also had emailed on a couple occasions in ensure we were satisfied and if we needed anything further. I will definitely be rebooking either here or with other of their affordable properties they manage. Customer service was exceptional and appreciated. Casa De Emdeko #330 was clean & comfortable with all the amenities we could ask for, from a completely stocked kitchen to snorkeling equipment and beach towels. It was a great choice. I would definitely return for another stay. The management company that handled the reservation process was very responsive and helpful. Thank you! Very nice updates. Clean. Friendly staff and very helpful. It was a wonderful experience. The condition of the condo made my friend and I think of buying something similar for future use! We very much enjoyed swimming in the salt pool, using the outdoor pavilion, looking out at the gardens grounds below and the ocean waves from the lanai. 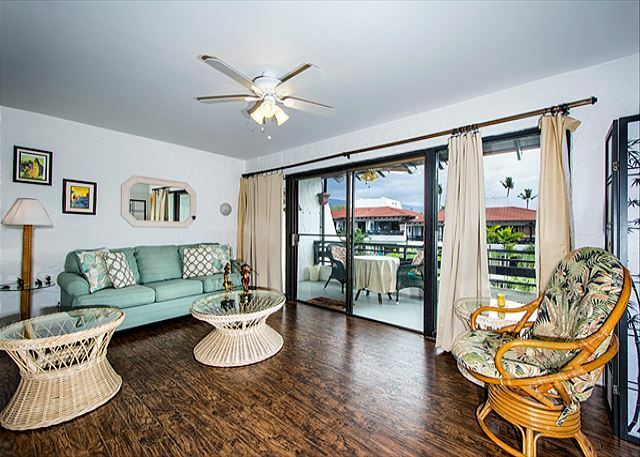 Love this unit, spacious, spotless and great view of the ocean! My husband and I have been coming to the Casa de Emdeko for 20 years. For us it is always great to be warm and see our friends. It is like a home away from home. If I was going to change one thing about the unit itself, I would lose some of the plastic flowers that are pretty tcky. There are so many lovely flowers on the island. They should be enjoyed. We've stayed at your place many times over the past 20 years and it's the only place we stay at. We love it at the Casa. Everyone is soo friendly and helpful. After initially being locked out and no answer on the emergency number, the next door neighbor helped find someone to let us in. The owner of Knutson's took the time to send a card to say how sorry she was and included a gift certificate to a local restaurant which we greatly appreciated, but did not expect. A class act by the owner, we thought. We were very happy with the Condo with the possible exception of the small screen TV. It was very difficult to see sporting events like the Super Bowl. Didn't even see the rude gesture during the half time show! This probably is not a problem for most visitors but we do stay a month. A great unit, very comfortable. Good pool. Time to replace couch pads, clean carpets and replace deck loungers that are torn and falling apart!